The body fat percentage of a person is the total amount of fat mass in the body, divided by the total mass of the body. The amount you get is the percentage of fat in your body. Staying fit and staying in shape is of the utmost importance now; that has nothing to do with the concept of beauty, but with your health. Being overweight or being obese never helped anyone, it just brings along with it a number of diseases. So if you’re on the heavier side, you really need to keep your weight in check. If you’re not, it certainly wouldn’t hurt to keep a tab in your weight. All health conscious individuals measure their weight and body mass index (BMI) regularly to make sure they’re within the limits.Keeping a tab of the fat percentage in your body is one way of doing that. If you’re a perfectionist, you would want to do it efficiently. In that case, you must look up Body Fat Chart Templates that are found online. Here, you can note down every time you calculate the percentage of body fat and check your progress for yourself. A body fat calculator would allow you to arrange your body fat data in the forms of rows and columns, and that makes calculating your body fat even easier. That way, you get to organize your body fat records in a logical manner. Body mass index or BMI is calculated on the basis of your height and weight. Based on these records, your ideal BMI and your ideal weight can be calculated. That will determine if you’re in the pink of health, or if you need to pay more attention on improving your lifestyle. One of the most common types of body fat chart templates is an ideal weight calculator. Your ideal weight is calculated on the basis of your BMI and your body fat percentage. Based on that, you can find out if you’ve reached your ideal weight, or need to work on it a bit more. 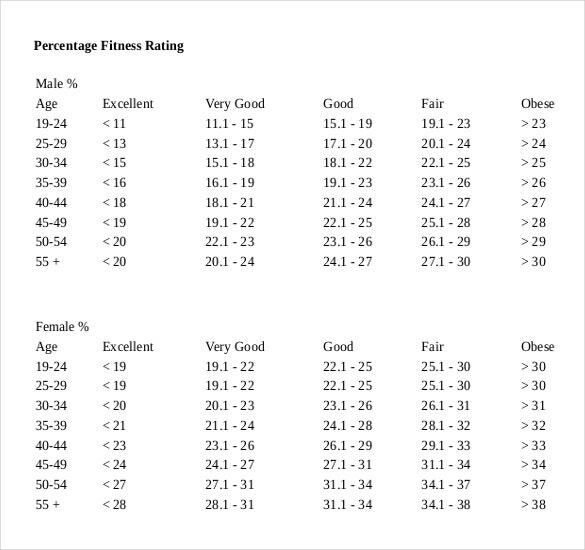 > Why Should You Use Body Fat Chart Templates? In the present day and age, staying in shape is imperative if you want to lead a healthy lifestyle. Plus, if you exceed the ideal body fat percentage, it could lead to several diseases and ailments. Leave all that behind with body fat chart templates. These will certainly help you get back in shape. There are Sample Word Body Tat Chart Templates which could help you with the keeping of the records. You could just download one, and edit and customize it every now and then whenever you calculate your body fat or BMI. Such body fat chart template examples could come in handy because they save both time and energy. You will not have to create a new chart every time you measure the percentage. You can simply update that chart you’ve created. It really is as simple as that! > How To Create Body Fat Charts Using Templates? Now that you’ve decided to download body fat chart templates, well done, you’ve made the smarter choice. 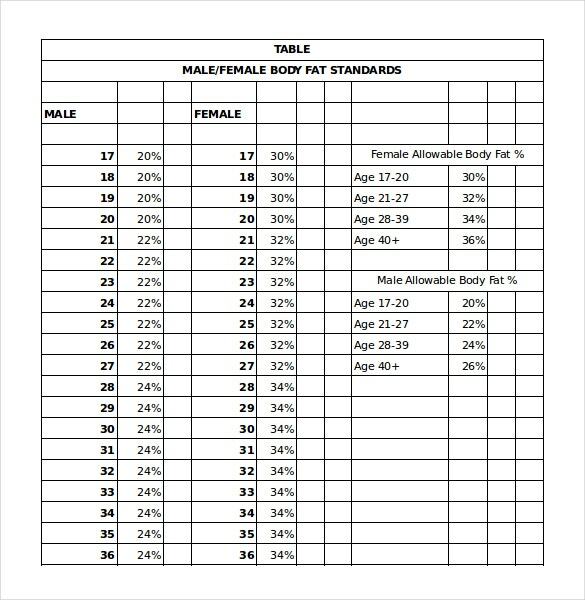 But editing and customizing body fat chart templates are not as easy as it seems. You still have to be careful and cautious while doing it. It is always better to go for templates which allow you to organize the body fat percentage in the form of rows and columns. That makes the data easier to follow and understand. Also, every time you measure it and enter it into the template, you will be able to compare it with last time’s records. That will show you if you’re making progress, or if you need to work on it a little more. Apart from that, all you have to do is edit and customize the templates! First, you must decide the type and purpose of the body fat chart template. Why do you need it? Do you want to calculate your body mass index? Or may be your ideal weight? Or do you simply want to keep a tab on your body fat mass? In each case, you will need separate templates. For example, you will need BMI Calculator Templates to calculate BMI and so on. Always choose templates which organize the data in the form of rows and columns. You cannot record data like this on ordinary charts. Such templates give it a no nonsense look and will contain only relevant details. Isn’t that what you want? 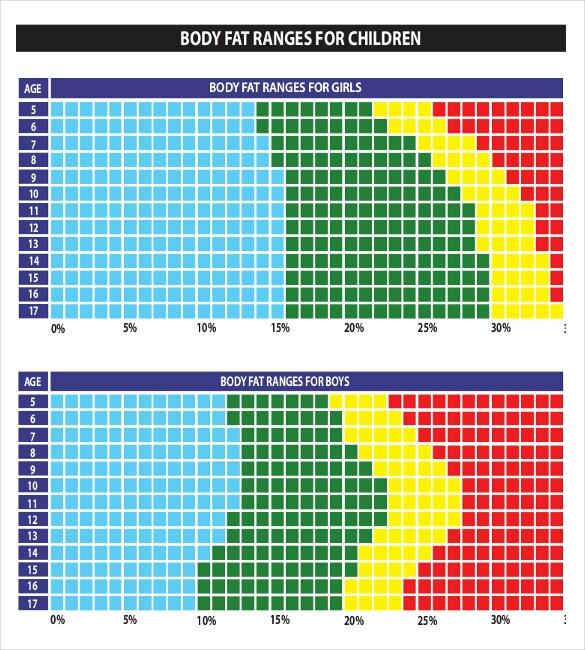 Go for body fat chart templates which can be customized. You can design your body fat chart any way you like. You can even add an inspirational quote or two if you want to keep yourself motivated. That would be an amazing way of designing your template. Do not forget to mention any details that might be important. 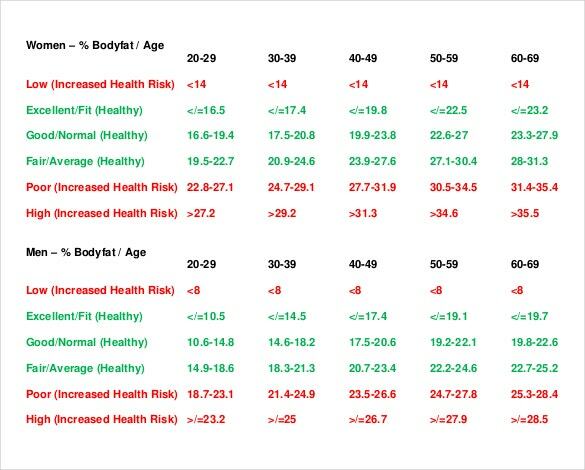 Body fat percentage calculation is highly technical and takes a lot of factors into calculation. That is precisely why you need to check and recheck the data you’re entering. It is usually the small errors that lead to severe consequences. 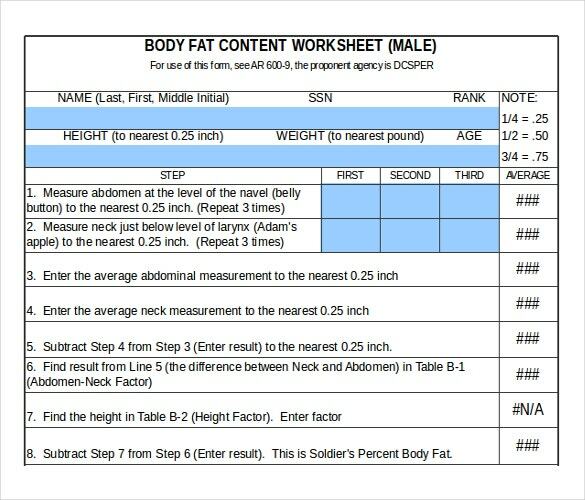 At template.net, we have an amazing collection of downloadable body fat chart templates. 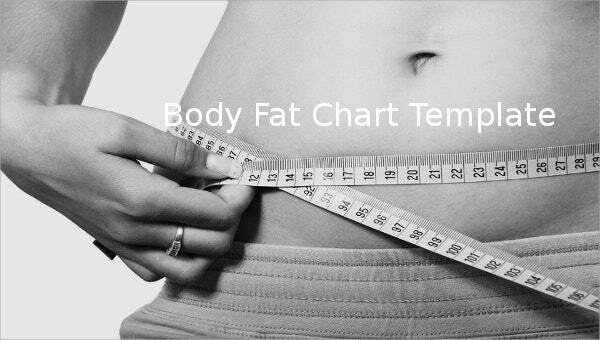 All our Body Fat Chart Templates have been crafted by experts with utmost care and attention. We believe in paying close attention to the little details that make all the difference. 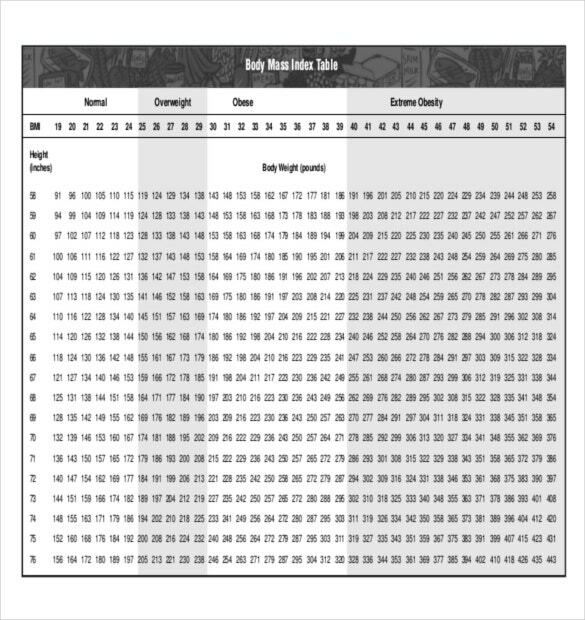 You can try any one of our free body fat chart templates, and see for yourself. We guarantee complete customer satisfaction, and you surely won’t be disappointed.